Will Iran Deal Meet The Same Fate As A Past U.S.-North Korean Arms Deal? : Parallels If Trump keeps his promise to do away with the Iran deal, it won't be the first time a Republican administration drops an arms deal inked by Democrats. Something similar happened under George W. Bush. 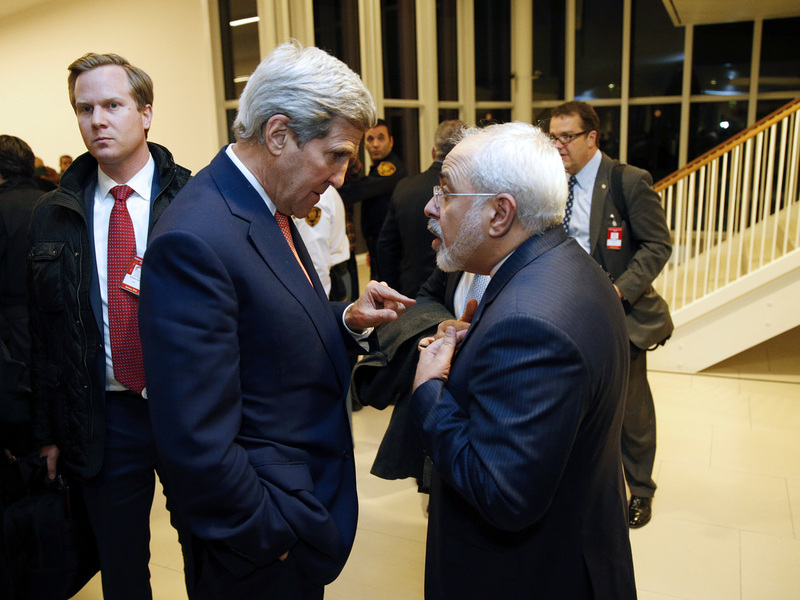 Secretary of State John Kerry speaks with Iranian Foreign Minister Mohammad Javad Zarif in Vienna on Jan. 16. The nuclear accord between Iran and major powers entered into force as the U.N. confirmed that Tehran had shrunk its atomic program and sanctions were lifted. One of the promises Donald Trump made on the campaign trail was to dismantle or renegotiate the U.S. deal with Iran that limits its nuclear program in exchange for sanctions relief. If he makes good on that promise, it won't be the first time a Republican administration has walked away from an arms deal negotiated by Democrats. In 1994 the Clinton administration struck a deal with North Korea that essentially would freeze Pyongyang's nuclear program in exchange for aid. The so-called Agreed Framework was highly controversial in Congress. It eventually collapsed in 2002, when the Bush administration confronted North Korea with evidence that Pyongyang was cheating. David Albright of the Institute for Science and International Security is predicting something similar when a Trump administration gets into office and decides how to proceed with Iran. "I think they will probably throw the deal aside," he says. "I witnessed how the Bush administration killed the Agreed Framework, which was a deal we were supporting pretty heavily in the 1990s despite some misgivings. They'll set it up so Iran will leave the deal." Albright says a lot depends on Trump's still-unnamed foreign policy team. In the North Korean example, Colin Powell, Bush's secretary of state, pursued a different approach from the hardliners. "In the Bush administration," he says, "Colin Powell put the brakes on a quick dropping of the Agreed Framework — and then once it was dropped, he also started a process to try to ... create a negotiating process to try to get to a better outcome." Neither the Bush administration nor the Obama administration ever reached a better outcome with North Korea, though. That worries other experts, including Melissa Hanham of the James Martin Center for Nonproliferation Studies in California. 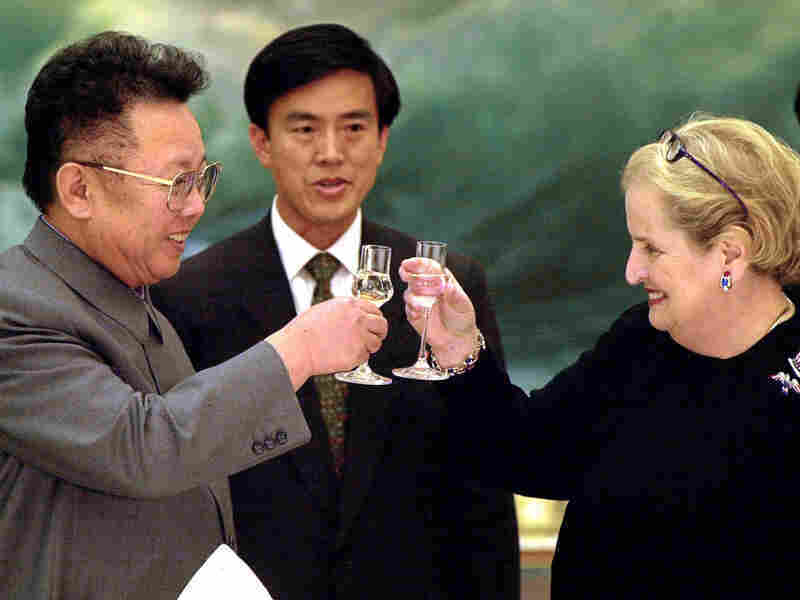 Then-Secretary of State Madeleine Albright and North Korean leader Kim Jong Il toast in Pyongyang on Oct. 24, 2000. The U.S. and North Korea signed an agreement six years earlier to curb North Korea's nuclear activities in exchange for aid, but it collapsed in 2002, during the Bush administration. "Today we are looking at a country that's had five nuclear weapons tests, and the worst relationship between the U.S. and North Korea since the start of the Korean War," she says. She's hoping that President-elect Trump will bring in advisers who will think twice before scrapping the Iran nuclear deal, which at least will buy the U.S. some time. "It is much more difficult to take nuclear weapons away from a country once they already have them," she says. "With North Korea, while there is a spectrum of opinion, I fall on the side where the Agreed Framework was our last, best opportunity — and the windows have shrunk and shrunk and shrunk since then." There is a lot of pessimism in the arms-control business these days, Hanham says. "The giant asterisks with Trump is that no one can predict what he's going to do," she warns. "And unfortunately, that goes true for North Korea, too." When it comes to Iran, another arms-control expert, Laicie Heeley of the Stimson Center, says it could be difficult for Trump to renegotiate the deal since other countries are parties to it. "This is going to be an interesting one, given his emphasis on the relationship with Russia," she says. "Russia is not going to want us to rip up this deal — they are one of our negotiating partners, and this deal is important to them." So if we see what Heeley calls "the deal-maker Trump" rather than the "bombastic" one, the president-elect will have to consider those relationships with Russia and Europe. Meanwhile, all eyes are on whom he will pick for secretary of state and other key foreign policy positions.